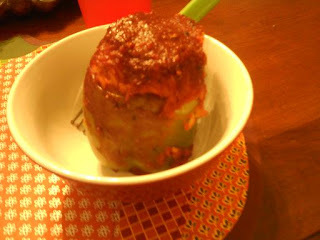 Last night I made up a recipe for a vegetatian stuffed pepper with butternut squash. It was yummy, and I was asked for the recipe, so here it is. Take the butternut squash, half it lengthwise and put it facedown on a baking sheet. Don't bother to take out the seeds- it is easier after it is cooked. Bake at 350 for about an hour or until a fork easily pierces the flesh. Cook the long grain rice as you normally would with the addition of the dried minced onion to give it a little extra flavor. I have a rice cooker, so set it and forget it. Once the butter nut squash is cooked, scoop out the seeds and then scoop the flesh into a bowl. Add cooked rice, salt and pepper, and mix to combine. Add about half to 3/4 of the tomato sauce mixture. Mix to combine. Take the green peppers, cut off the tops and scoop out the middle, including all seeds. Fill the peppers with rice mixture. Baste some tomato sauce on top. Bake peppers at 350 degrees for an hour, basting with more tomato sauce every 10-15 minutes. *Note: I did not measure my ingredients. I tasted as I went and adjusted to my preference. I am guessing as to the amounts I put in my dish. Please take this recipe as a guide and do your own thing with it and remember to taste as you go. That is the only way to know your seasonings are correct.